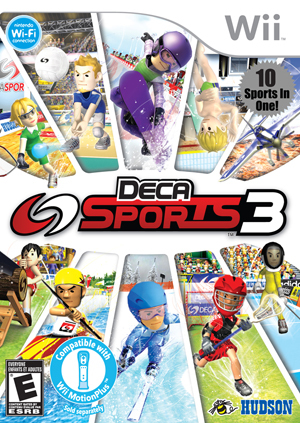 Deca Sports, the hit sports compilation series that has over 2.5 million units sold through worldwide, is returning to Wii with 10 COMPLETELY NEW sporting events in Deca Sports 3! Simple controls let your entire family play together, while advanced controls let you take advantage of Wii MotionPlus. Swing, flip, and spike your way to the winner's circle across all of the included events: Indoor Volleyball, Racquetball, Air Racing, Freestyle Kayaking, Lacrosse, Fencing, Halfpipe (Snowboarding), Giant Slalom (Skiing), Springboard Diving, and even Log Cutting! This time around, you can play online in 4 events (Volleyball, Lacrosse, Racquetball, & Fencing)! The game is known as Sports Island 3 in Europe. The graph below charts the compatibility with Deca Sports 3 since Dolphin's 2.0 release, listing revisions only where a compatibility change occurred. This page was last edited on 7 January 2018, at 10:16.